Epson WorkForce AL-M400DTN Monochrome Laser Printer, 1200 dpi Res, Upto 45 ppm. The WorkForce AL-M400DTN is one of Epson's most hardworking and reliable A4 monochrome laser printers, thanks to it having one of the highest duty cycles in its class - up to 200,000 pages. This model has a compact footprint that suits medium-sized workgroups and comes with a 1,250-sheet paper capacity as standard - expandable up to 2,350-sheets. Aimed at medium-sized workgroups who are looking for high productivity, this model offers reliable, high-performance printing as well as Gigabit Ethernet and fast, double-sided printing. The Workforce AL-M400DTN also offers consistently fast printing up to 45 ppm, with a first-page-out time of 5.5 seconds, as well as high-quality results up to 1,200 dpi resolution. Internal memory can also be increased to 1152 MB, to help process all business printing needs. High-performance is teamed up with reliable printing, thanks to high-yield toners and a heavy-duty output, which provides excellent return on investment. 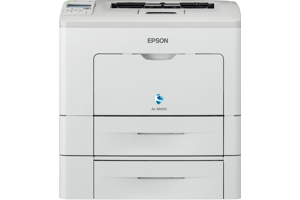 In addition, users can print and share from anywhere in the office thanks to Epson's mobile printing app, Epson iPrint. The reliability of the WorkForce AL-M400DTN allows businesses to concentrate on their work without the inconvenience of downtime, enhancing productivity and providing greater peace of mind.